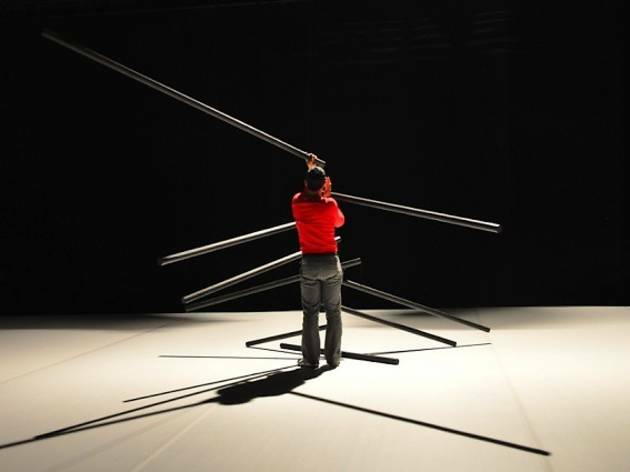 One of four shows that choreographer Fabrice Lambert is putting on in Paris between now and March 2014, Nervures revolves heavily around on-stage mechanics. A dancer dressed in red and wearing white trainers is suspended from a system of poles and pulleys – for 50 full minutes, the dancer interacts with the props, pushing against them and reacting to their movements. The inventive choreography plays with space and light, as in the superb opening sequence where the dancer plays with the projected shadow of the poles – poles that also provide a soundscape through a range of vibrations. It’s a seductive piece, more about physicality than intellect, but with larger theme of man’s interaction with the raw power of nature.